The above software is called Station Playlist. 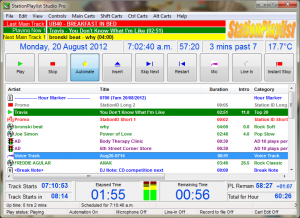 Station Playlist or SPL as it is called is probably the best radio automation software for the price. Very often, especially lately, we have been asked to install SPL in place of older more expensive programs. 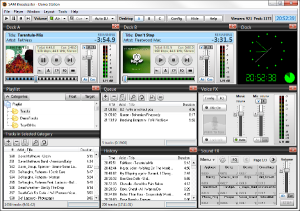 SPL comes in two parts; Creator used for scheduling commercials, music and programming and Studio which is the automation/live broadcast software. Unfortunately, like other broadcast software, some clients claim SPL is really not well supported. There is a Yahoo news group that is a wealth of information and one may ask questions if you are registered. Purchasers may contact SPL support by email, but the return is slow and many times questions are misunderstood, always be specific. There is no phone support. Hence the need for services like ours. We, as stated in our mission, want you the client to learn the software so you are able to be your “own support”. SPL, when set up correctly, rarely needs attention. There are may ‘safeties’ built into the system. When problems arise one can usually fix the situation on the fly. Be careful of companies or support services that demand monthly payment! There is NO reason why YOU would need continuous monthly support. Broadcast programs like SPL do not need constant attention. If you are calling a non-SPL support person repetitively then that person may be planting “issues” within your system. This is done to keep you coming back and spending more money. In many cases we have found “hacks” that are not typical of broadcast software. Please refer to our Mission statement. Again, we are NOT affiliated with Station Playlist. We do like it, endorse it and use it in all of our radio station construction and projects. 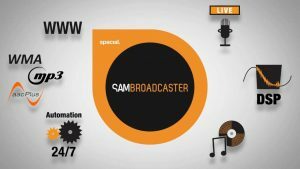 Above is SAM Broadcaster. This is truly a terrible program if you want to run an actual radio station. SAM started out as software that provided music to retail brick and mortar stores. The original version played music and commercials for indoor business operations. It wasn’t until much later that the folks at Spacial Audio decided to make it into a DJ program of sorts. In 2007 it became even more popular in nightclubs. Then as the smart phone boom exploded SAM became somewhat popular for internet streamers. This is a very “crashy” program and it is poorly written. Users often suffer the “grey screen of death”. That happens when SAM literally gets jammed up. SAM claims that it schedules commercials and music using a “clockwheel” system. SAM simply does not schedule on time, nor can it maintain any type of correct broadcast schedule. It will run in an automated fashion but do not expect it to function anything like an actual radio station. Another thing that should be noted; all of SAM Broadcasters testimonials are fake. We found this out the hard way. Oh and good luck trying to get any type of real support. Their common response to every problem is to restart your computer. We help with the above products. Should you have trouble with these products we can help. Contact us for support. Our regular fees apply.